As the new iPad Air comes up, Apple fans already start hammering Apple’s online store to get this full-sized iPad Air with lighter, slimmer and brighter appearance but improved speed and power. And when you are eager to move their movies, songs, and photos to iPad Air for watching anywhere and anytime, iTunes is a basic and good tool to complete the process. With iTunes, you can easily sync video, music, photo, iBook, etc to iPhone, iPad and iPod Touch. Follow below guide to learn now about it. Here I take movie files transfer as an example. Similar operation for streaming music, photos, and iBook to iPad Air using iTunes. Step 1. Open iTunes, and connect your iPad Air to your Windows computer. Step 2. 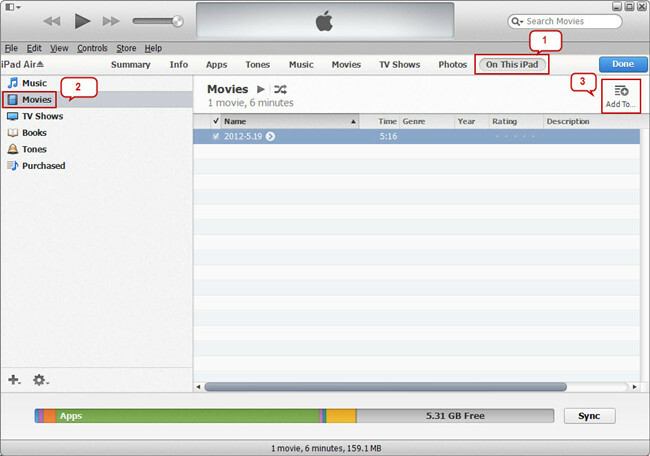 Switch to “Movie” category, click “File” tab in the left navigation bar, and add local file or folder to iTunes library. When the files are added, you would see “New” tab at the top right corner. Step 3. Click on iPad Air in the right navigation bar, then follow the path “On This iPad > Movies > Add To” to stream videos from local computer to ipad Air. Wait for the uploading file process complete and all files would be successfully transferred to your iPad Air. Step 1. Connect your iPad Air with your Mac, and open iTunes. Step 2. 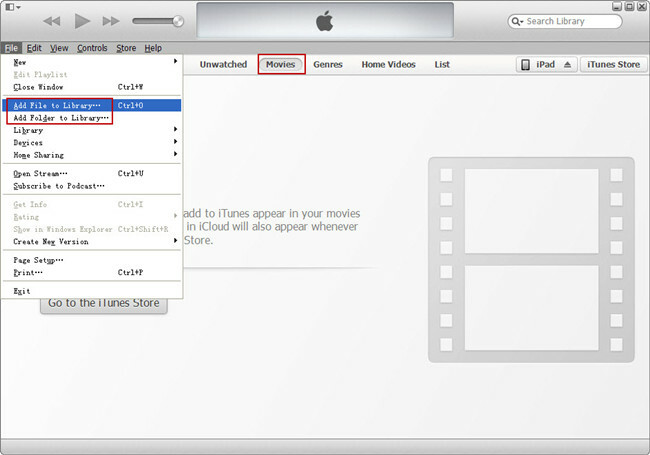 Add videos, music, photos and iBook from Mac to certain iTunes library by following the path “File -> Add File to Library”. Step 3. Select your connected iPad Air from the list of devices. Under the device, choose one category for file transfer, such as Music for songs, Movie for videos, etc. Drag and drop the files you want to copy to this category, and you should see a progress bar that will indicate how long it will take to copy the file. Plug the USB flash drive with an SD card into your computer and create a new folder titled DCIM. 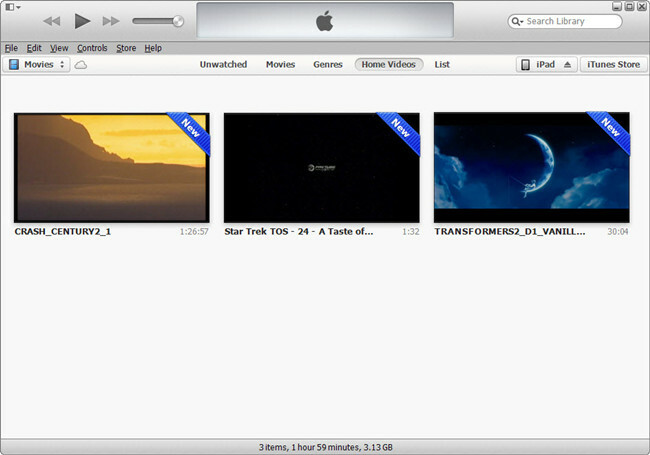 Then put your movie/photo files into the folder. Now plug the flash drive into the iPad using the iPad Camera Connection Kit. 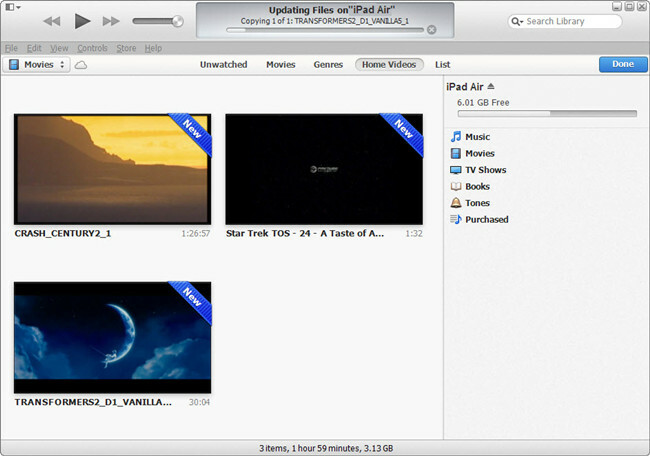 Open the Photos app, the movie/photo files should appear and you can import media to your iPad Air. NOTE: The files must have a filename with exactly 8 characters long (no spaces) plus the file extension (i.e., my-movie.mp4; DSCN0164.jpg). And when using certain digital cameras or SD cards, you may be unable to delete images from the device. In these situations, the Delete option will not appear. iCould is a wireless service to help iOS users to transfer documents, music, videos, etc between iOS devices and PC/Mac. With iCloud, you can watch movies, read books, and listen to music anywhere you are. 1. If you want to copy videos to iPad Air in other formats like MKV, WMV, AVI, FLV, MTS, M2TS, MOV, MPEG, MPG, MOD, TiVo, VOB, etc, you will need reformat these video files first. You can try this professional iPad Air Video Converter to batch convert videos in various formats up to 1080p to iPad Air playable format (e.g. MP4). 2.If you have the intention to transfer Blu-ray, DVD movies as well as your personal HD video files to iPad Air, you'd better get the best all-in-one video convert tool Video Converter Ultimate to have fastest and most effective conversion.